Rice University has launched an interdisciplinary initiative to focus its strengths in advanced biomanufacturing techniques to solve grand challenges. The iBIO initiative will bring Rice’s faculty and student talents to bear on problems that can be solved by programming bacteria, proteins or other biological agents to produce chemicals, catalyze reactions or sense conditions. Ramon Gonzalez, a Rice professor of chemical and biomolecular engineering and of bioengineering, is founding director of the new program, which will be based at the university’s BioScience Research Collaborative. “Biomanufacturing not only uses biology but engineered biology to do things,” Gonzalez said. “We’re talking about using biology to solve problems that aren’t necessarily biological in nature. That could involve treating cancer, which is a biological problem, or making a molecule with applications as a polymer, which is not. “The problems span agriculture to energy to human health. The key thing is that biology is going to enable solutions,” he said. Gonzalez said iBIO will not only serve as a clearinghouse for industry to seek the help of Rice scientists and engineers, but will also proactively look for opportunities to apply Rice research and participate in industry motivated research problems. The initiative has defined three initial research portfolios on which to focus. Bioscientist George Bennett, the E. Dell Butcher Professor at Rice, will lead the thrust on molecules. Jonathan Silberg, an associate professor of biosciences and bioengineering, will lead the research on microorganisms and viruses. Junghae Suh, an associate professor of bioengineering, will lead the studies on human cells and tissues. Molecules: IBIO will employ genetic engineering of microbes to convert abundant feedstocks into useful biofuels and chemicals while leaving a small environmental footprint. 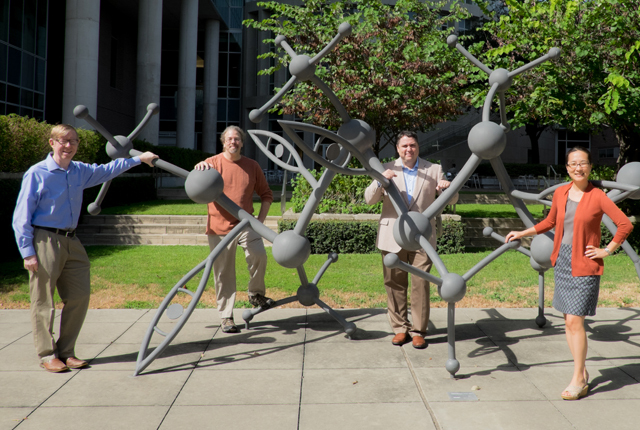 Rice labs are working to engineer enzymes with new activities for medical applications; design metabolic pathways and networks to produce industrial chemicals, organic acids, solvents and polymers; and use low-value agricultural waste or stranded methane as feedstocks for bioconversion. Microorganisms and viruses: This thrust will focus on understanding and manipulating microbes to address climate, food and water challenges. Rice labs have developed a reporting strategy to study microbial behaviors in hard-to-image environmental materials like soils, sediments and biochars. They are also optimizing soil and water bioremediation techniques and engineering probiotics for health applications. Human cells and tissues: This portfolio will investigate cell-based therapies for the treatment of human disease. Rice researchers are studying tissue engineering and biomedical imaging for early cancer detection; custom viruses for drug and gene delivery and the detection and treatment of disease; biochemical, molecular, cellular and biomechanical characteristics of normal and diseased cells and tissues; the design and fabrication of novel scaffolds; and culturing conditions for engineered tissues. Gonzalez said the initiative will leverage the university’s existing outlets for bringing research into the public realm, including the Office of Technology Transfer, the Rice Alliance for Technology and Entrepreneurship, OwlSpark and the NSF Innovation Corps. “We want to be able to say, ‘This is a problem we think we can solve, this is how we can solve it and this is what we have to offer,’” said Gonzalez, who has also served as a program director for the federal government’s Advanced Research Projects Agency – Energy (ARPA-E) and as director of Rice’s Energy and Environment Initiative.